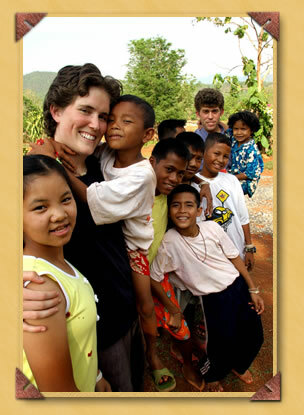 Kapong, in Southern Thailand, is the new site for Children’s World Academy. 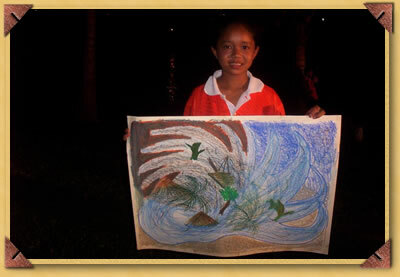 With the extensive destruction, caused by the tsunami, there is a need for a nurturing home school village community which is an ideal setting for Amicus’s original concept of an “intergenerational village.” Saow, the girl in the picture, expresses her anguish through her art. Painting is one form of therapy for the children to help them cope with their trauma and loss. Linnea and Tyson Phillips, active Amicus representatives and English teachers, are children of Mary and her husband, Amicus’s executive vice-president, Matthew Kelly. Amicus is actively working towards the development of Children’s World Academy in Kapong. We provide what we can in financial and volunteer assistance. Children’s World Academy is a unique school and home for orphans and children at risk from a variety of difficult backgrounds. The school has an innovative curriculum integrating entrepreneurial education and community development.